KABUL (AP) — Afghanistan's military said 27 insurgents were been killed in ground fighting and airstrikes in a western province on Tuesday, in what appeared to be a major blow to Taliban influence in the region, while four civilians died in a NATO airstrike in the south. NATO and Afghan forces launched an operation western Badghis province before dawn, with troops parachuting behind Taliban lines to trap the militants, the regional Afghan corps commander Gen. Jalandar Shah Behnam said. Fighting continued well into Tuesday afternoon, he said. In addition to the 27 Taliban bodies collected, one Afghan soldier was killed and five wounded, he said. One U.S. soldier was reported wounded. There was no immediate comment on the fighting from NATO command in Kabul, but Behnam described the targeted area as one that had emerged as a Taliban stronghold in the past three years, from where the militants fired at supply aircraft and kidnapped members of Afghan and foreign engineering teams. It lies on a key highway connecting several provinces in the country's west and northwest. "This had been a serious threat against our forces," Behnam said, vowing that operations would continue to clear the area of Taliban. "The removal of the opposition from this area is very important to us." The general said no civilians had been killed or injured in the offensive, which focused on a sparsely populated area about 185 miles (300 kilometers) from the capital Kabul. In recent years, the insurgents have expanded their reach beyond their strongholds in the east and south of the country — although those regions remain the focus of much of the fighting in the country. A NATO airstrike on a residence in the southern province of Helmand killed four insurgents and four civilians — two women, an elderly man and a child, an Afghan official and the military alliance said Tuesday. Afghan authorities and NATO said they had launched a joint investigation into the deaths, which could further strain relations between President Hamid Karzai and his international allies. Washington on Monday voiced new concerns over recent statements Karzai questioning the nature of their alliance. According to NATO and provincial government spokesman Dawood Ahmadi, insurgents had fired at NATO troops and Afghan army and police from inside the compound in Helmand's Nahri Sarraj district on Monday, prompting the airstrike. The presence of the civilians was discovered only after the troops entered the compound, NATO said. Afghan and international forces have launched a joint investigation "to review the factors leading up to this unfortunate loss of civilian life," NATO said in its statement e-mailed to journalists. Ahmadi confirmed the report and said it was possible that the casualty count could increase. "We have already sent a delegation to investigate this incident and bring the (Helmand) governor a complete report with the exact information and figures as to how it happened, how they died, and by whom they were killed," Ahmadi said. While a large majority of civilian deaths are attributed to the insurgents, civilian deaths at the hands of foreign forces are highly sensitive because they stir resentment against the 120,000 foreign troops in the country and could drive more Afghans into the arms of the Taliban. U.S. commanders have ordered troops not to use heavy firepower when civilians are present and avoid nighttime house searches. The commander of U.S. and NATO forces in Afghanistan, Gen. Stanley McChrystal, imposed strict limits last year on the use of airstrikes. 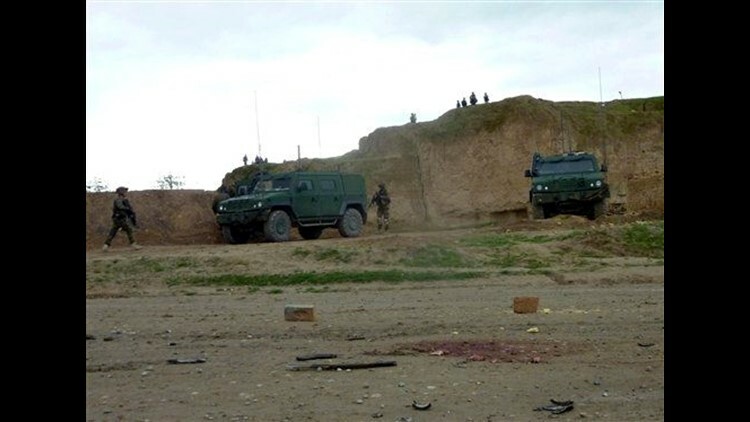 Earlier this week, NATO confirmed that international troops were responsible for the deaths of five civilians, including three women, on Feb. 12 in Gardez, south of Kabul. Rising political tensions between Karzai and Washington in recent days have begun to overshadow efforts to push back against the Taliban ahead of the expected drive into the insurgency's southern heartland of Kandahar. In a speech to Afghan lawmakers over the weekend, Karzai made the extraordinary threat to join the Taliban if foreigners don't stop meddling in Afghanistan. While that's considered mere bluster, Karzai has been fuming for months about what he considers Washington's heavy hand. He seems to be gambling that blaming outsiders for the troubles in a society with a long tradition of resisting occupation will bolster his stature at home — while carrying little risk because the U.S. has no choice but to deal with him. White House spokesman Robert Gibbs described Karzai's comments on Monday as "troubling." "On behalf of the American people, we're frustrated with the remarks," Gibbs told reporters. State Department spokesman P.J. Crowley warned such comments could undercut U.S. support for the Afghan mission. "Clearly, you know, what he says does have an impact back here in the United States and he should choose his words carefully," Crowley told reporters on Monday. Karzai has long chafed under what he considers excessive international pressure. Those complaints escalated last Thursday when he lashed out against the U.N. and the international community, accusing them of perpetrating a "vast fraud" in last year's presidential polls as part of a conspiracy to deny him re-election or tarnish his victory — accusations the U.S. and the United Nations have denied. Karzai told CNN on Monday that he has no intention of breaking with Washington, which is pouring 30,000 more troops into the fight against the Taliban. "It's just to make sure that we all understand as to where each one of us stands," Karzai said. "Afghanistan is the home of Afghans and we own this place. And our partners are here to help in a cause that's all of us. We run this country, the Afghans."